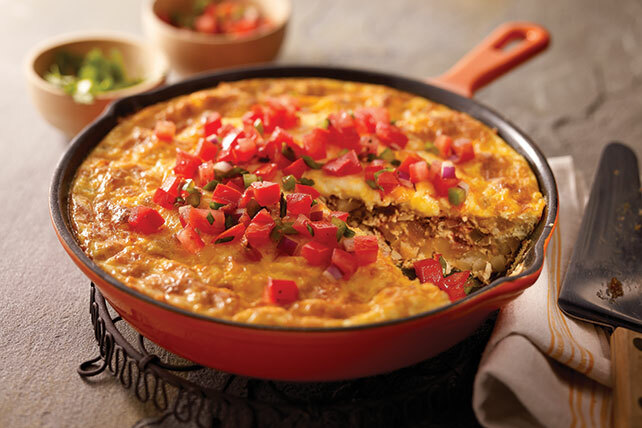 Made with green chiles and pico de gallo, this Mexican-style omelet gets festive style points. It's hearty, too, thanks to chorizo and hash brown potatoes. Whisk eggs and sour cream until blended; pour over chorizo mixture. Top with remaining cheese. Bake 25 min. or until center is set. Serve topped with pico de gallo. Serve with fresh fruit and a cold glass of fat-free milk to round out the meal. Substitute TACO BELL® Thick & Chunky Salsa for the pico de gallo.